The Predators played four quality opponents this week – the Colorado Avalanche and Buffalo Sabres are in a playoff spot, the Arizona Coyotes are an upstart team, and the Chicago Blackhawks are a rival. The Predators finished the week 2-2-0, ending their five-game home stand and a period in which they played at home in eight of their past nine games. They lost to the Avalanche 3-2 after Nathan MacKinnon’s line accounted for four points and the Predators’ penalty kill gave up two power play goals on two opportunities. It was a close, back-and-forth contest against one of the league’s best teams in which the Predators controlled play. In their next matchup, they were shutout 3-0 by the Coyotes despite outshooting them 29 to 25. However, the Predators were outpaced 9-6 in high danger chances at five-on-five. They turned it around against the Blackhawks with a 5-2 victory after they jumped out to a 3-0 lead in the first period and ended the period up 4-1. The game got chippy as Duncan Keith was ejected in the first period and the Predators went on a seven-minute power play. They scored once on the man advantage, and gave up a shorthanded tally, but the game was never in danger as head coach Peter Laviolette won his 200th game with the Predators. The home stand wrapped up with a 2-1 defeat of the Sabres and the game was as close as the score indicates. They may have outshot the Sabres 25-22, but Buffalo had more scoring chances and high danger chances at five-on-five and had the momentum in the third period. The Predators took four penalties but killed all of them and also went one-for-two on the man advantage thanks to a bomb from the point by Ryan Ellis. Kevin Fiala scored the game-winning goal as he continued his hot streak with five points in his past five games. The team’s injury situation is a broken record at this point, yet they keep piling up. Sure teams deal with players going on injured reserve all the time and have to find ways to replace that lost production, but rarely are a team’s injuries concentrated among their best players like the Predators’ have been. Viktor Arvidsson and P.K. Subban have been out of action since Nov. 10 and Nov. 13, respectively. Kyle Turris went on injured reserve on Nov. 25 with an upper-body injury and without a timeline for return. 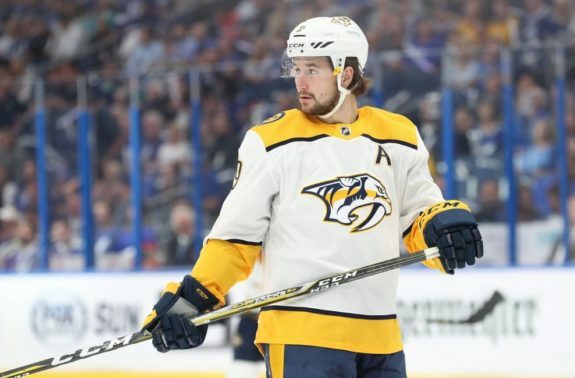 This week, things got worse as Filip Forsberg went down with a hand injury that is expected to keep him sidelined four-to-six weeks. That means of the Predators’ top line, only Ryan Johansen remains. Plus they’re missing their second line center and their best defenseman. In response to the injuries, the Predators have called up players from the AHL in an effort to replace that lost production. Rocco Grimaldi is one such player. He has been called up twice this season and has appeared in nine NHL games, mostly in a fourth-line role with one goal on the season. Yet despite a lack of scoring, his tenacity on the forecheck and ability to make the correct play make him a useful player for Laviolette. Another player who received a call-up but has since been sent back down is Anthony Richard, who was brought up to fill in for an ill Nick Bonino. Richard made his NHL debut against the Blackhawks and skated just over seven minutes in it. After the game, he was sent back to the Milwaukee Admirals, where he paces the team’s forwards in points. The player fans have been waiting for most, Eeli Tolvanen, finally received his call-up this week following the Forsberg injury. The 19-year-old has 11 points in 21 AHL games and made an immediate impact with the Predators. In his fourth career game, he scored his first goal against the Blackhawks. His goal occurred in the first period on a backhand he lifted over Cam Ward after his forecheck forced a rushed pass from Ward. He added an assist on a Craig Smith power play goal to complete his two-point effort. He finished the game with 15:48 of ice time, including 2:45 on the man advantage. Since his recall, he has mostly played with Smith and Calle Jarnkrok and the Predators have high five-on-five metrics with him on the ice. These include controlling 57.1 percent of shots, 100 percent of goals, 61.1 percent of scoring chances, and 55.6 percent of high danger chances. Who knows how long Tolvanen stays in the NHL once Arvidsson, Forsberg, and Turris return, but he is showing his ability to perform at the NHL level and looks to be a future star. It’s easy to chalk up the Predators’ loss to the Avalanche as facing a team with an elite top line that, when given the chance, will burn you every time. That was partially the case in the Nov. 27 matchup between the two teams, but not the entire story. Goaltender Semyon Varlamov was also a major reason the Avalanche stymied the Predators. He faced 38 shots, stopped 36 of them, and also turned aside 15 of 17 medium danger shots and all five high danger shots. Against the Coyotes, the Predators faced rookie netminder Adin Hill, who has been the reason the team has won their past three games. Against Nashville he stopped all 29 shots for his first career shutout. Of those shots, 14 were deemed medium or high danger but fewer were concentrated near the goal line than they were against the Avalanche. The Predators controlled play in this game, including 61.2 percent of five-on-five scoring chances, but Hill was too strong in net. The 2019 IIHF World Junior Championships are quickly approaching, Dec. 26 through Jan. 5 to be exact, and the participating nations are beginning to announce their selection camp invites. It’s an opportunity for NHL teams to see their prospects compete in the most important prospect tournament of the year. It’s also a way for fans to see the next wave of players looking to make an impact on the NHL roster in coming seasons. So far, the Predators have had one prospect invited to selection camp, center Jachym Kondelik of the Czech Republic. Stay tuned to see what other Predators prospects receive invites to their nations’ selection camps. 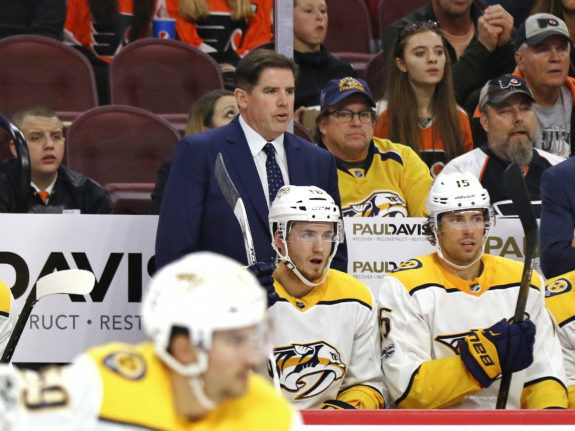 With his 200th win behind the Nashville bench, Laviolette hit an important milestone. It was his first time reaching that many wins with a team, although he has won at least 145 games with two other franchises. He currently has 590 wins and is tied with John Tortorella as the winningest American-born coach in league history and for 19th all-time in wins. He has a long way to go to surpass Barry Trotz’s 557 wins for most in franchise history, but considering Laviolette is just the second coach in team history, it goes to show the stability the Predators have experienced.